Home » News archive » REVENGE: Ann…uropean Tour. REVENGE will furthermore release their new EP 'Deceiver.Diseased.Miasmic' on December 7. It’s been a few years since REVENGE stormed the black metal scene with latest full length 'Behold.Total.Rejection' (2015). Now, the Canadian extreme metallers have returned with two new songs. 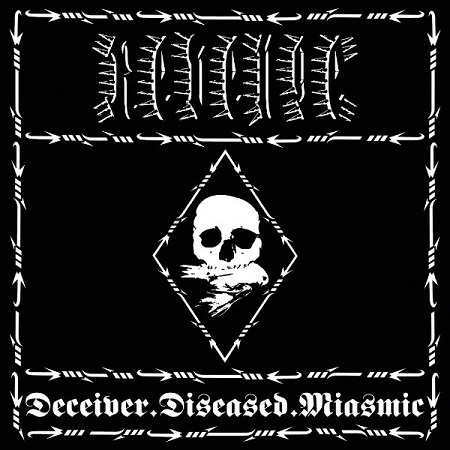 The upcoming EP 'Deceiver.Diseased.Miasmic' represents a new chapter in the band’s nihilistic and hateful mission against the world. REVENGE was founded by vocalist and drummer J. Read continuing in the vein of his previous outfit and war metal instigators CONQUEROR in the year 2000. The Canadians have since delivered some of the most severe and brutal music the metal underground has ever produced. Simply put: they are one of the most extreme bands in existence. With each release, J. Read has pushed the limits further. The two early EPs 'Attack.Blood.Revenge' (2001) and 'Superion.Command.Destroy' (2002) were followed by first full-length 'Triumph.Genocide.Antichrist' (2003). Each release was either greeted by stunned enthusiasm or sheer hatred by critics and fans alike. There was never any room for middle ground with punishing albums such as 'Victory.Intolerance.Mastery' (2004), 'Infiltration.Downfall.Death' (2008), 'Scum.Collapse.Eradication' (2011), and 'Behold.Total.Rejection' (2015). Immersed in a thick layer of sonic muck, the beastly grunts and spiteful screams, the crusty guitar sound and the assaulting drums drown out any pretense of accessibility and affability. ‘Deceiver.Diseased.Miasmic’ emanates a grubby atmosphere, pushing the limits even further than on previous efforts. For those dreading the coming holiday season, REVENGE has made the ultimate soundtrack for the most wonderful time of the year.